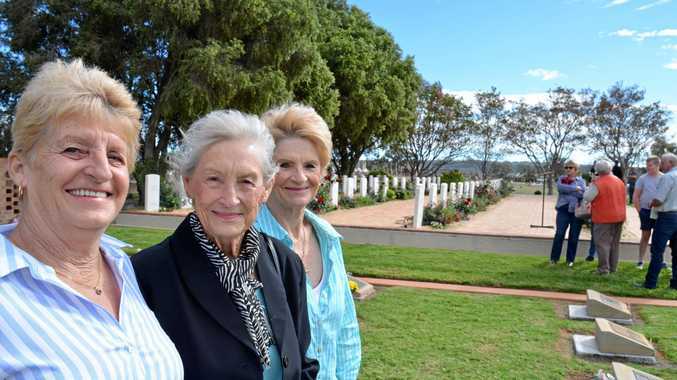 TWO separate crashes in the space of just 10 minutes in front of a sunflower field outside Allora has prompted fears it will take someone being killed for sightseers to get the safety message. 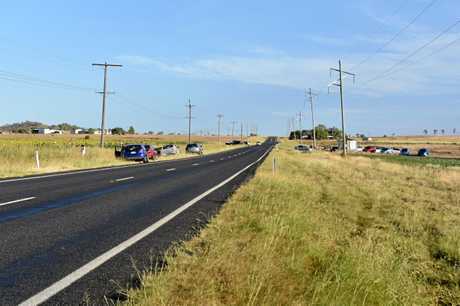 Emergency services were called to a vehicle rollover on the New England Highway at Geitz Rd about 4.14pm on Saturday but before they had arrived, a call about a second crash came through. The two-vehicle smash happened in the same location, just nine minutes after the first. Five people were taken to Warwick Hospital following the incidents, with injuries including back and neck pain, cuts and bruising. The crashes prompted an outcry on social media, with many people sharing stories about near misses they've had near the sunflower fields. Allora Police officer-in-charge Sergeant Damian Grace said he was disappointed and concerned by the behaviour displayed near the popular attraction. Drivers have parked too close to the road's edge, opened doors into oncoming traffic and slowed unexpectedly while pedestrians have crossed dangerously across the highway, Sgt Grace said. "We need to remind people when they're driving around that they are on a national highway with a high volume of traffic," he said. "They don't seem to realise what consequences their actions may have." Allora resident Lynn Close said it had been "mayhem" at the fields. Mrs Close said she had seen cars slow suddenly, children running across the road and cars parked irresponsibly. "Someone said they saw someone setting up a camera on a tripod in the road, it's like they don't realise it's a main highway," she said. "They're just meandering around like they've got all the space in the world. "It's going to take someone to get hurt or killed for people to take it seriously." A lack of consideration is also being shown in the sunflower fields, as people walk through gates and fences in their plight for a good photo. "It's their own naivety and lack of education and lack of consideration that they just think they can pull off the road and walk into somebody's farm," Mrs Close said. "It happens every year, it's not just this year." Adriana Buzas, who lives on Upper Spring Creek Rd, said she was angry about the number of people who trespassed on crops. Aside from the risks of snakes and spiders, people could also hazard a biosecurity risk by walking through the crops. "I've been telling people to get out of the crop since this started," Ms Buzas said. "It's all good and well advertising to draw people to the area for tourism but what needs to be at the forefront is people's safety and this is someone's land and someone's income. "I'm all for people coming out and looking at them; I think all this comes down to educating everybody." Sgt Grace said the crashes at the weekend had prompted police to increase patrols in the area. "We have to now, given what's happened, we can't rely on people to use common sense," he said. "People need to be aware of the surroundings and the road conditions, to use caution and to drive to the conditions." At the weekend he issued two parking tickets and cautioned several other drivers, most of which were from outside the Southern Downs. 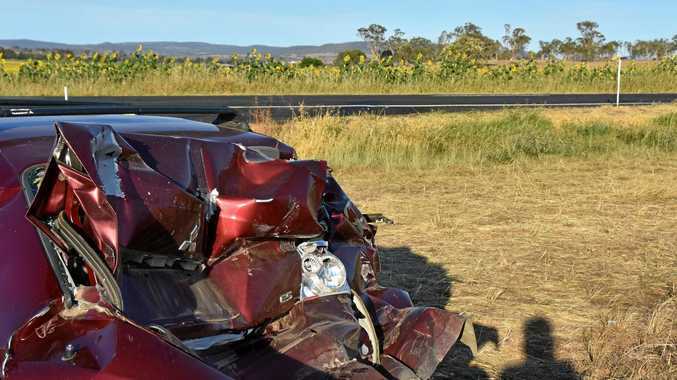 The 20-year-old Warwick man driving the ute that rolled on the highway at the weekend was given a $304 fine and one demerit point for following a vehicle too closely. The second crash is still under investigation but reports suggest the driver of a maroon Mitsubishi stopped in the middle of the road. 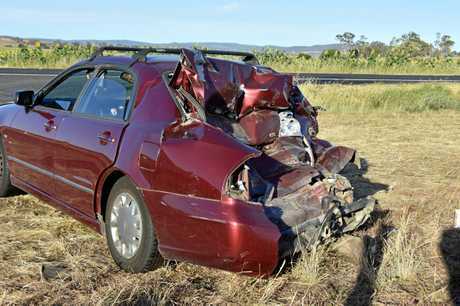 FOLLOWING two crashes at a sunflower field on the New England Highway, many other drivers shared their horror stories of near-misses near the popular attraction. There were at least 20 cars parked at the corner and people strolling across the highway without even looking when we went past earlier this afternoon. My husband said it was an accident waiting to happen! Not to mention the damage all those people would be doing to the crop by walking through it and breaking flowers off! It's a pity that everyone didn't take note of the article that was written awhile back regarding the sunflowers. Yes... they are extremely beautiful, but they are also somebodies livelihood. The contamination that is caused from people tromping through the field is detrimental to the crop. So sightseers are in danger from the traffic and the flowers from the sightseers. I had a fully loaded b-double in front of me on the way home from work on Thursday and we both fully locked up because someone just pulled out without looking. My daughter and another P plater travelling behind her had to cross the centre line of the highway between here and Toowoomba to avoid hitting an elderly man last weekend. The man was part of a group of sunflower enthusiasts walking beside the highway, then without warning the man stepped onto the road directly in the path of the two vehicles. No amount of tourism dollars spent in town is worth a loss of life. I come through there on Friday with a caravan on sandwiched between two trucks and we all had to hit the brakes hard to avoid an accident. I was towing a float passed there other day and had someone stop dead in front of me. They've only been there for 20+ years but nowww people care cos Insta. We live at Allora and I was driving past there yesterday and saw a child run back towards the highway while the adults were casually strolling towards to the sunflowers. Driving back from Toowoomba last week and there was 8 cars pulled over, people walking through the private property, it's ridiculous!